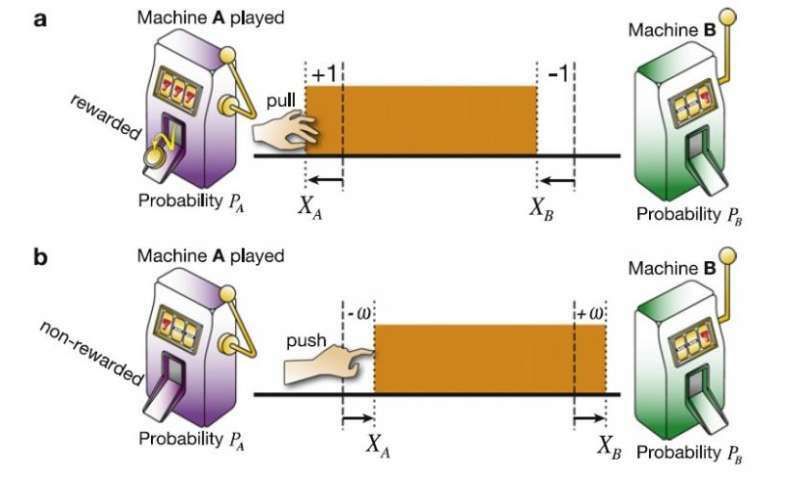 In tug-of-war dynamics, an iron bar can decide which slot machine has the higher winning probability by moving to the left for each rewarded play and to the right for each non-rewarded play of Machine A. The bar’s movements are caused by physical fluctuations. Credit: Kim, et al. (Phys.org)—Decision-making—the ability to choose one path out of several options—is generally considered a cognitive ability possessed by biological systems, but not by physical objects. Now in a new study, researchers have shown that any rigid physical (i.e., non-living) object, such as an iron bar, is capable of decision-making by gaining information from its surroundings accompanied by physical fluctuations. The researchers, Song-Ju Kim, Masashi Aono, and Etsushi Nameda, from institutions in Japan, have published their paper on decision-making by physical objects in a recent issue of the New Journal of Physics. "The most important implication that we wish to claim is that the proposed scheme will provide a new perspective for understanding the information-processing principles of certain lower forms of life," Kim, from the International Center for Materials Nanoarchitectonics' National Institute for Materials Science in Tsukuba, Ibaraki, Japan, told Phys.org. "These lower lifeforms exploit their underlying physics without needing any sophisticated neural systems." As the researchers explain in their study, the only requirement for a physical object to exhibit an efficient decision-making ability is that the object must be "volume-conserving." Any rigid object, such as an iron bar, meets this requirement and therefore is subject to a volume conservation law. This means that, when exposed to fluctuations, the object may move slightly to the right or left, but its total volume is always conserved. Because this displacement resembles a tug-of-war game with a rigid object, the researchers call the method "tug-of-war (TOW) dynamics." Here's an example of how the idea works: Say there are two slot machines A and B with different winning probabilities, and the goal is to decide which machine offers the better winning probability, and to do so as quickly as possible based on past experiences. The researchers explain that an ordinary iron bar can make this decision. Every time the outcome of a play of machine A ends in a reward, the bar moves to the left a specific distance, and every time the outcome ends in no reward, the bar moves to the right a specific distance. The same goes for a play of machine B, but the directions of the bar movements are reversed. After enough trials, the bar's total displacement reveals which slot machine offers the better winning probability. The researchers explain that the bar's movements occur due to physical fluctuations. "The behavior of the physical object caused by operations in the TOW can be interpreted as a fluctuation," Kim said. "Other than this fluctuation, we added another fluctuation to our model. The important point is that fluctuations, which always exist in real physical systems, can be used to solve decision-making problems." "The TOW is suited for physical implementations," Kim said. "In fact, we have already implemented the TOW in quantum dots, single photons, and atomic switches." By showing that decision-making is not limited to biological systems, the new method has potential applications in artificial intelligence. "The proposed method will introduce a new physics-based analog computing paradigm, which will include such things as 'intelligent nanodevices' and 'intelligent information networks' based on self-detection and self-judgment," Kim said. "One example is a device that can make a directional change so as to maximize its light-absorption." This ability is similar to how a young sunflower turns in the direction of the sun. Another possibility that the researchers recently explored is an analogue computer that harnesses natural fluctuations in order to maximize the total rewards "without paying the conventionally required computational cost." I checked the calendar to see if this was April 1st. Nope. They really expect us to take this crap seriously. They fail to tell us how the iron bar moves when a slot machine is played. The bar is not pulling the handle, so is some mechanism in the slot machine pulling or pushing the bar? In any event, whoever is pulling the handle on the slot machine is causing the "fluctuation", and that is usually a human, presumably intelligent . . . The article doesn't mention any minimum number of trials it takes before the iron turns into gold. Now how the hell do you reward an iron bar? By removing some rust from its back? This is a seemingly simple summation of decision making that makes me really think about what we consider to be living or dead. I have had a challenging time classifying one group of atoms versus another as living or dead. In my mind, there is something fundamentally wrong about this more or less arbitrary binarification of life. There is a type of universal fairness at the atomic level, in the sense that atomic interactions aren't greedy, that plays so well into intelligence. A system can make decisions given the correct setup even at the most fundamental of levels. I think this is a hint that everything is "alive" to some degree; I had more or less been leaning towards the ability to metabolize as a mechanism to maintain some level of stability denoted as alive but that itself has not questioned the underlying question of is there such a thing as a live or dead? I really think we have totally misunderstood nature in a fundamental way; we are part of the whole, not above it. And for people analyzing this analogy way to literally, the bar has made a decision based on external inputs, i.e. which machine is the most likely to return a win. How the iron bar is "read" for its output ends there. Reality is not limited to two slot machines and an iron bar. Imagine light impacting some molecules with the appropriate atomic switches to determine whether it changes its buoyancy or not based on conformational changes. The one thing I've learned from molecular biology, all decision making networks can and will be used in one way or another within the cell. Nature does not limit itself in this sense, i.e. processes are not hidden from one another. Some dim bulbs in here apparently can't understand that this is not an indication the bar has free will, but a confirmation of some basic laws of physics on a micro-level. Every action has an equal and opposite reaction. Conservation of energy, etc. It does interestingly add validity to several gambler theories that a machine that hasn't paid off in a while is "due" to pay off. One steals a concept when one uses it without understanding what it presupposes of the other concepts upon which it is built. "Decide" presupposes the concept of "consciousness" in any living thing that decides to take an action. If they want to redefine "decide" to include non conscious physical activity then create a new concept that does so and not pervert perfectly valid concept like "decide" which presupposes the concept "consciousness". The hair on my head makes decisions. Every time I read something stupid it gets hotter. Because "The stupid, it burns". Eventually it will decide it doesn't want to live in this stupid world anymore so it catches fire. Good bye stupid stupid world. So basically you are using a physical object as a counter register where the thing you are measuring will either increment or decrement the position of the bar. I'm sorry, but I don't really see anything profound or new about using a physical object for this function in any way. If there's something I'm missing, I'd appreciate it if someone would point out just what it is. Oh Man.. Wait until I show you a balance scale. I'd appreciate it if someone would point out just what it is. I can't see the point either. We could just as well move a tiny stone left and right depending on which machine wins, and the end result of that random walk will place the pebble nearer to the machine that wins more. There's absolutely no need for any "volume conserving" mechanisms. It's just a tally of the number of wins subtracted. If you kick a stone, the stone will "count" how many kicks it has recieved. What decision making is there to be had? The researchers appear to be saying that any system with a conserved property, such as the iron bar with its conserved volume, can produce information processing capabilities in the right configurations, such as tallying the number of wins in slot machines. "Volume conserving" is just a roundabout way of saying that the bar is rigid. When you move one end, the other end moves along. What they're essentially saying is that an abacus-like device can be used to count, which is completely obvious and that's not the main point of the article. They're really discussing a different way (tug-of-war dynamics) of using an abacus to solve a statistical problem, and the iron bar is completely irrelevant to the question. The difference in this case is that instead of just rewarding the winning machine as in a random walk situation, you punish the machine for losing as well, and that makes for an efficient algoritm. In this paper, we proposed TOW dynamics for solving the MBP and analytically validated that their high efficiency in making a series of decisions for maximizing the total sum of stochastically obtained rewards is embedded in any volume-conserving physical object when subjected to suitable operations involving fluctuations. Basically, their proposed method can be applied to any sufficiently volume-conserving object - such as a person. Following the suggested operations, in the simple case of two slot machines A and B, whenever machine A wins the person is moved to machine A unless they are already there, and whenever machine A loses, the person is moved to machine B unless already there. The same is done with machine B in reverse. That way the person keeps playing the winning machine until he loses, then switches machines until he gets another winning streak, and this is proves to be an efficient means to keep the player at the winning machine. Bloody ridiculous. The bar is the equivalent of a mark on a piece of paper, or any other method of accounting. The decision is made by the operator who chooses to use the machine with the most marks. What a waste of time. Indeed. The article is grossly misrepresenting their research. As with most other commenters, I find this "research" to be ridiculous. I would like to sell them a device I have called a "yardstick". It can make even bigger decisions. Great. Now all we need to know is how to decide whether the iron bar vibrates toward the winning machine or away from it. Does another iron bar tell us that? Isn't the bigger pile of money beneath the winning machine an even better indicator? And how does the iron bar tell a winner when the winnings are paid out on slips of paper instead of by rattling coins into a payout tray? This looks about as brilliant as the rain-predicting rock. This reminds me of the old argument about whether a thermostat is intelligent. Does a computer make a decision, when it follows an IF-THEN command? If so, then there is no reason to deny decision-making capability to any device - even an iron bar. My iron bar is not making any decisions at all. It has not moved right and it has not moved left even though I have asked it some very thought provoking earth-shattering and discerning questions. Might have to send it back to Amazon. Joking aside, this is much more a pattern discernation of "random" probabilities. You do realize that probabilities are as reflective of "locality" as are the real things in that given locality? This article is pseudoscience devoted towards satisfying atheist/secularist/progressive agendas. Atheists falsifying science to support their irrational hatred of free will. And...Did you create a login and sign in just to show your close-mindedness and "1" me? What about my point, did you fail to understand? It appears you're incapable of dealing with facts or responding to the simple facts that were stated. Simple "facts" that are without empirical background regarding athiests, etc. YOu did not state any empirically known "facts. Hence you are responding emotionally.
" Hence you drift off topic and dodge any point that is relevent here. Respond to the facts, the points made, in a rational and somewhat reasonable way, or don't respond at all. Thanks. YOUR comment was off topic, therefore dodging the article. Your vitriolic comment was aimed at "atheists, etc". Be a little more reasonable in your labelling technique. Your comment on the group was irrational and therefore considered an emotional response to people you (and your ilk) feel are trashing the word of a god. Emotions are not a scientific way of examining a subject. Saying that the final position of the iron bar is due to a _decision_, is at best an .i.n.t.e.r.p.r.e.t.a.t.i.o.n. , and indeed a most misleading one. If we consider the position of an iron bar as a decision, then we should do the same for any logical gate. But then, what are we to consider a complex synthesis of logical gates such as a computer? This interpretation doesn't seem to enlighten us about something, much more to lead into new insights. I'm seeing nothing more than the use of the position of a bar as a memory device, or an accumulator. This is nothing more than saying, for example, the stones in a river bottom "remember" where the currents were strongest and their direction by their differential movement and where the stones end up over time. Then concluding that the stones "decide" where the river will flow next to a large degree. The bar, or stones, aren't making a "decision". They are simply a part of the chain of causation. The headline is silly. This has no more far reaching implications for AI than did magnetic tape, floppy discs, bubble memory, or any other storage device. The researchers are lost in a forest at night, bumping their heads into trees in the dark, and determining the bumping causes forests to exist. Lisa could be laughing herself silly, thinking ... Look at these idiots discussing if an iron bar can make decisions. Well done Lisa, good fun. This is an insane article. Maybe there were translation problems? A decision is a choice which affects something else. The iron bar makes no choices and affects nothing. The iron bars are smarter than our current president and many contenders for the office. The bars are smarter than the editor who prints this nonsense with a straight face. the example used is a farce. The iron bar does not move by itself. All that is happening is something external is banging on the bar, of course it moves. That has zero to do with decisions except by the brain dead person who decided to print this nonsense.